Whoever you are, whatever your age, there is something to surely captivate you in our vast country. Whether exploring the red sands that sweep across our iconic outback, the lush green rainforests, our world famous beaches or our pulsing and vibrant metropolitan cities, Australia truly encapsulates the definition of diversity. The diversity doesn’t stop at the scenery however, with our country boasting one of the most multi-cultural populations in the world. The people are relaxed and open-minded with an emphasis on population growth through increased migration. Australia’s deserved reputation for its affordable high quality of life stems from excellent and affordable education and medical facilities, a growing economy, a democratic government, low crime-rates and a wonderful climate, which all culminate to give the Australian people an exceptional quality of life. Australia has surreal beaches, lush rain forests, lagoons, vibrant metropolitan cities, fascinating regional towns and a very vast outback. It is a young country with a vibrant and ever growing economy, great opportunities, a wonderful climate and friendly people. 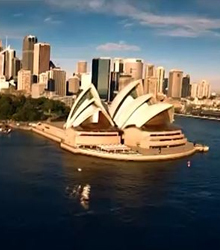 Australia is home to just 21 million people and is one of the most advanced and prosperous economies in the world. In fact Australia has had one of the most outstanding economies of the world in recent years. Australia is an island continent of extraordinary contrasts with enormous natural wealth, stunning scenery and a quality of life that far surpasses most of the other countries. Australians enjoy a safe, friendly and prosperous life. Crime rates are amongst the lowest in the world. The people are relaxed and open-minded; the cities are booming and the opportunities are growing. Immigration is an important feature of Australian society. The Australian Government aims to increase the population dramatically over the next 50 years – in fact, the plan is to almost double the population and most of that growth will come from new immigrants from all parts of the world. People born overseas make up almost a quarter of the total population. The federal government sets the numbers for immigration and reviews it on a yearly basis. Australia's immigration policies are non-discriminatory and applicants must satisfy a set selection criteria irrespective of the country they migrate from. With lots of sunshine, white sandy beaches, a dynamic cultural scene and adventures every day, Australia is never dull. There are beautiful, clean parks, beaches, rivers and country areas to visit. The weather is mostly warm and sunny. You can go fishing at thousands of locations or visit hundreds of sport and recreation facilities. Australia has modern well-equipped schools, colleges and universities that use advanced technology and offers a wide range of subjects and career options. Australia has excellent and affordable education and medical facilities and a welfare system for all ages. On the political front, Australia is a democratic country and every Australian citizen has the right to vote for local, state and federal government. Elected government officers hold open meetings with constituents in an effort to give every citizen a voice on how Australia is governed. Please click below for the information specific to different states and territories.